If you are looking for information on the Port of Subs franchise business opportunity, Port of Subs franchises or Port of Subs franchising, then you have come to the right place. Customers have been enjoying the great taste of Port of Subs sandwiches for over 30 years. In 1972, two brothers from New Jersey opened a modest submarine shop in Sparks, Nevada called the "Sub Shop". John Larsen, a Public Accountant who had been advising the Sub Shop owners, seized the opportunity to purchase an interest in the business and later bought the business in 1975. After taking the helm, Larsen sponsored a community-wide contest to choose a name for the Sub Shop to differentiate it from imitators. In a review of more than 10,000 contest entries, Larsen chose the name ... "Port of Subs". Between 1975 and 1985 the Larsen's developed ten company-owned units. Throughout the years many people approached them asking for units in other cities because the quality and taste of their products was outstandingly unique. Therefore, with the help of Francorp, the nation's largest franchise consulting firm, the company began franchising in 1985. Over the years the Port of Subs brand has become synonymous with quality sandwich making and superior customer service. Port of Subs made-fresh-to-order sandwiches are prepared while the customer looks on and the unique taste comes from freshly sliced, top quality meats and cheeses, freshly baked breads and zesty dressings and spices. Port of Subs also offers a breakfast sandwich, hot sandwiches, fresh salads, chips, an extensive line of deli trays, desserts and a variety of refreshing beverages. Currently Port of Subs has over 140 units open in six Western states and is positioned to grow the system to over 200 units within the next two years. Over the years Port of Subs has developed a proven, effective system of operation that will give you the edge necessary to create a thriving business. Entrepreneur Magazines "Franchise 500" and Restaurants and Institutions "Top 400" have recognized Port of Subs as one of the top franchising opportunities. Voted Reno's Best sub-sandwich restaurant 18 years in a row. Repeatedly voted Las Vegas's Best sub sandwich restaurant. Voted Bellingham, Washington's Best Sandwich in 2001. Port of Subs is a member of the International Franchise Association. My dream has always been to own my own business. What is the most successful device for small business ownership? If you're looking for the safest way to start a business today, it's franchising. According to U.S. government statistics most franchise businesses succeed while those of individuals starting a new business on their own have a much higher failure rate. Franchising's advantages over going into business for yourself include: opening quicker, experiencing success sooner, developing a customer base faster, having less risk and being more profitable. Your success as a franchise business owner is based on the proven success of the franchisor and your commitment to precisely follow the established operating system and to superior customer service. Name recognition, time-tested methods of doing business, purchasing power, a strong support system you can call on for training and advice and a well-defined advertising program and business plan are a few of the reasons franchising is so popular. Port of Subs is building a team of interdependent franchisees who are dedicated, serious-minded individuals committed to growing the value of the brand name by maintaining quality, consistency and convenience. By building a stream of loyal customers for high quality sandwiches, the Port of Subs franchise system can help you achieve your goals ... your dreams. What makes Port of Subs the best business opportunity? A tremendous opportunity exists to fill the needs of today's consumers for a healthy, great tasting, quick service alternative to the burger/pizza restaurant choices - and that's where Port of Subs comes in. Consumers desire for convenience, quick service, a healthy menu selection, variety, and a comfortable atmosphere is making the fast-casual niche (a blending of fast food's speed with casual dining's menu) one of the hottest market segments in foodservice according to a new survey reported in Nations Restaurant News. Port of Subs, which focuses on fresh-baked bread, high quality ingredients, the freshest vegetables and produce available and premium sliced to-order meats and cheeses for made-to-order sandwiches and salads, is well positioned to capitalize on this growing segment. 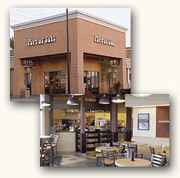 Our new restaurant design and quick friendly service results in a superior customer experience. Why should I choose Port of Subs vs. another sandwich franchise?